I thought we could take a last look at the Pont Neuf before we continue down the Seine. This photo provides a detailed look at one of the bastions on the bridge with some pedestrians relaxing and enjoying the view. 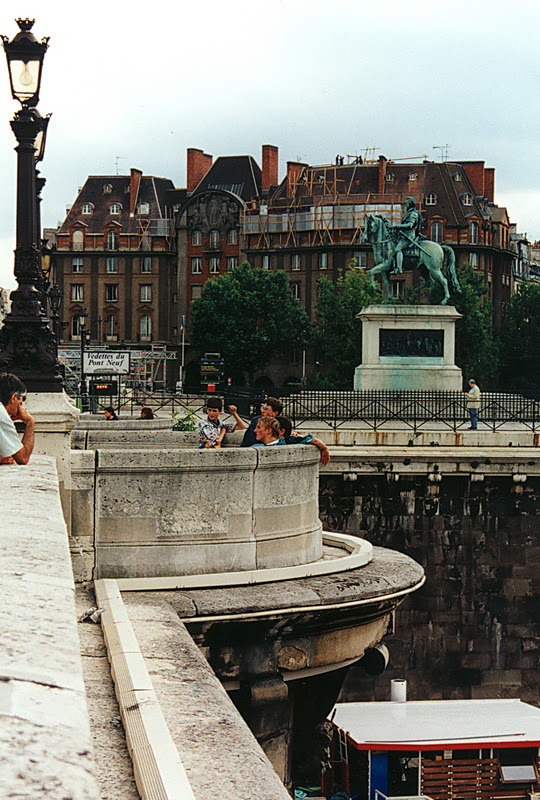 In the background is a statue of Henry IV, who was very active in the getting this bridge completed. The original statue was torn down during the French Revolution and rebuilt when the Bourbons returned to power in 1818. Note that the bridge deck extends well past the balustrade and supports some kind of utility or perhaps it's for the scaffolding that will soon be erected for bridge repairs. The French limestone on this bridge must be sensitive to acid rain, since it looks in terrible shape. They must have replaced a lot of the stonework during the repairs for the bridge's 400th anniversary. Seine River Bridges: Pont Neuf (3) by Mark Yashinsky is licensed under a Creative Commons Attribution-NonCommercial-ShareAlike 3.0 United States License.